When YG Entertainment previously announced that BIGBANG would be coming to Malaysia as part of their “MADE” world tour, it was of course celebrated with much fanfare by Malaysian VIPs (as fans of BIGBANG are lovingly known). It was an understatement to say that Malaysian fans were excited as we witnessed a huge amount of fans who literally squealed after successfully getting their hands on tickets to attend the upcoming leg of the tour. Fans queued up as early as 10th May (a whole 9 days before the day of the ticket launch) to ensure that they have a chance to see their favourite band live in concert. Tickets were snapped up by fans once the ticketing counters opened at 11am, and this resulted in Cat 4 tickets (which was the cheapest and costed RM288) being sold out 2 hours later. BIGBANG’s popularity was proven once again as an estimated of 1,000 fans turned up, which caused more than 80% of concert tickets to be sold out on the 1st day of sales. The 1st fan who queued up was from Malacca and she was also the 1st one who queued up for the ticket launches of BIGBANG’s “Alive” in Malaysia, G-Dragon’s “One of a Kind” in Malaysia, and Taeyang’s “Rise” in Malaysia. There were already around 300 fans gathered outside the venue 1 day before the official ticket launch. 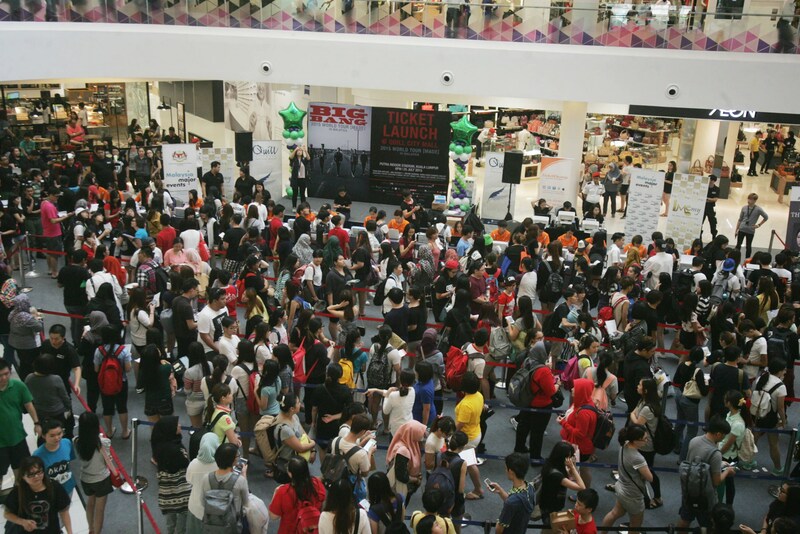 By 11am, there were so many fans that the queue was forced to continue outside the mall. Most of the fans who waited in line overnight came in groups and they took turns waiting by alternating between their daily responsibilities and queuing up. In the 1 week that fans gathered, they were forced to move locations 3 times to ensure their safety. Concert merchandises and albums that were sold at the venue were completely grabbed by fans before the event ended. What else can we say but VIPs are indeed a dedicated bunch? BIGBANG is made up of 5 members, namely T.O.P., G-Dragon, Taeyang, Daesung, and Seungri. After a 2-year hiatus, they finally returned on 1st May, with “Loser” and “Bae Bae“. They also announced that they will be releasing a full studio album, titled “MADE” on 1st September 2015. The world tour is held in conjunction with the album release as a way to thank fans for their devotion and commitment. It is still not too late if you want to see BIGBANG live as tickets can still be purchased through the TicketCharge website. You can also visit IME Productions’ Facebook and Twitter for more details. X Infinity World Music Showcase: Seungri Coming To Malaysia In October!